Quarterbacks dominate the headlines during draft season, but they don’t often make a fantasy impact in their rookie campaigns. Since 2011, only five first-year signal callers put up QB1 FF numbers: Cam Newton (QB3, 2011), Robert Griffin III (QB5, 2012), Andrew Luck (QB8, 2012), Russell Wilson (QB11, 2012) and Dak Prescott (QB6, 2016). Interestingly, three of those five players were top-three in rushing yards and all of them finished among the top-eight in terms of mobile production. That makes this year’s most discussed prospect an interesting target. 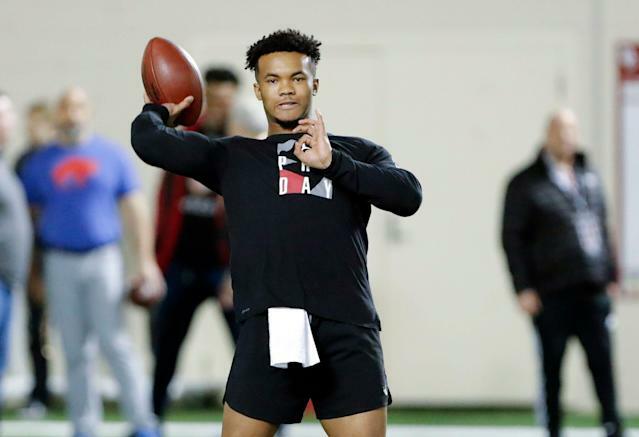 There’s no denying Kyler Murray’s ability on the ground, but his landing spot and surrounding weapons will determine his success … and, perhaps, further advance a mounting shift in offensive strategy. Regardless, each of these rookies figure to invade the fantasy landscape over the coming months. Get to know them now, before everyone else does. Fun Fact: A dual sport standout, Murray was selected by the Oakland A’s as the ninth overall pick in the 2018 Major League Baseball amateur draft. Claim to fame: Plays like he has an electrical current pulsing through his veins. Possessing the build and tenacity of a terrier, Murray is an incredible improvisational artist who has the ability to make something out of nothing. He has rare escapability (18 sacks in 2018) and the ability to throw with touch on the move. Trying to tame: Murray is extremely undersized for the position (5-foot-10 and 205 pounds), which has led to concerns about his long-term durability. Only having played as a starter for one year, his experience is limited. That’s particularly important to note since his skill-set would require a massive overhaul to any interested offense (and limits the players able to work as his back-up, were he to miss time with an injury). The Take: Murray’s size and skill-set requires viewers to rethink the definition of an NFL quarterback. While reviewing his tape there were times I thought I was watching C.J. Spiller playing QB. Drafting Murray is all about leaning into innovation and a willingness to hit the reset button on long-held beliefs as well as previous attempts at progress. Fantasy fit: Due in large part to comments made by new head coach Kliff Kingsbury, Arizona is the internet’s most chalk landing spot for Murray. The Cardinals’ o-line is a disaster, but Murray’s ability to elude pressure could allow for some Deshaun Watson-esque plays. The former Sooner could certainly do fantasy damage his first year in Glendale. However, I’d be stunned if he made it all sixteen games without falling victim to injury (again, a la Deshaun Watson). Personally, I’d like to see him land in Cincinnati (which means he’d either have to fall to the 11th spot or the Bengals would have to trade up) with new head coach Zach Taylor. He may not have immediate success, but Murray’s unique talents and the burn-it-all-down state of the franchise are a perfect match. Claim to fame: With prototypical size (6-foot-4 and 228 pounds) and impressive arm strength, Lock is a confident passer who plays with swag. He can uncork a gorgeous rainbow and hit a man deep while also extending plays with surprisingly quick and effective wheels. Trying to tame: Yes, Lock’s hands are small (9 inches, but that should be the least of teams’ worries). More concerning are his inconsistent mechanics and sloppy footwork, which have likely contributed to his struggles in the short to intermediate passing game. The Take: A gunslinger with an ideal build and above-average mobility, Lock has developed some bad habits (and uses his arm strength as a crutch) in part because he’s had three different offensive coordinators (Josh Henson, Josh Heupel, Derek Dooley) over his time at Mizzou (2015-2018). As evidenced by his Senior Bowl performance, however, the 21 year old’s upside is massive. He’s an ideal candidate to follow the “Kansas City model” and learn behind an incumbent QB for a season. Fantasy fit: Denver’s last few attempts to secure talent under center (Brock Osweiler, Paxton Lynch, Case Keenum) have all backfired, but Lock could be the balm to ease the Broncos QB woes. John Elway has reportedly been taken by Lock’s talent and believes the Mizzou product is a top-ten talent. Assuming that the rookie could learn behind Joe Flacco for the bulk of 2019, and noting the team’s young (and exciting) offensive pieces, Lock has the potential to make noise in 2020 (if not sooner). Claim to fame: A prototypical drop-back passer, Haskins gives the ball plenty of zip and gets it out of his hand quickly. He excels in the short to intermediate area of the field, executing on ball placement and accuracy. Trying to tame: As a one-year starter Haskins’ experience is minimal. He’s also a subpar athlete with heavy feet and limited mobility. Additionally, his game lacks fluidity and seems out of synch for stretches, partially due to a lack of touch and erratic mechanics. The Take: Haskins is a raw talent with the potential to develop into a traditional backdrop passer. The game, however, has changed. His lack of escapability and concentration in the face of pressure means that this kid is going to take a ton of sacks at the next level. My colleague Matt Harmon was spot on when he said, “Haskins will need everything around him to be perfect in order to truly thrive,” on the Yahoo Fantasy Football podcast. Fantasy fit: Miami needs a long-term solution at the position and Haskins could learn under Ryan Fitzpatrick. Furthermore, the team could make a plan to build around Haskins, keeping his flaws in mind as they look to the future. Fun Fact: Jones was coach by David Cutcliffe at Duke. Interestingly, Cutcliffe coached both Peyton and Eli Manning at Tennessee and Ole Miss, respectively. Claim to fame: A three-year starter with good skills and solid technique, Jones is a clean player with impressive ball placement, particularly in the intermediate area of the field. Additionally, the North Carolina native is a willing and effective scrambler who distributes the ball equitably and intelligently. Trying to tame: At this point, Jones is not a vertical passer. His arm strength and deep ball accuracy both need improvement. He’s also clearly in his head a lot, trying too hard to be perfect, rather than getting better. My take: Jones is a capable signal caller with the talent and grooming to perform at the next level. However, he needs to tighten up his throwing motion and become more decisive in order to make an impact at the next level. Fantasy fit: Eli Manning thinks it’s likely the Giants will draft a young QB this month, but it’s unlikely they’ll use their first pick (No. 6) to do so. That means they’ll miss out on the top-three prospects in this year’s class. Given Jones’ connection to the franchise (ahem, Cutcliffe) as well as Dave Gettleman’s obvious personality preferences, the former Blue Devil seems like an ideal fit … on paper, at least. The G-Men’s lack of high-end receivers and porous o-line will mirror the cause of many of Jones’ collegiate struggles. Yikes.